One of the things I rarely run out of is things to write about, but I also know how tricky it can be when you’re under the gun and looking for inspiration. When time is short and themes are elusive, it can be difficult to come up with just the thing to write about, which people would like to read about! To this end I thought that throughout this year to come at the end of each month I’d compile a post full of ideas on themes and things to write about in the month to come. As I researched this the remit widened a little as I found more and more things to cover. I hope you find it useful! After the busy-ness of the last few months, there are fewer feast or festival days in the winter chill of January. That being said, both Epiphany (6th January) and Burns Night (25th) could garner lovely posts – I know I’ll be making some chicken and haggis pie to commemorate the latter. Travel posts – dreaming of sunshine in the wintertime can be good for the soul! Special days can be fun to commemorate if they fit with your likes, passions, causes or hobbies. As well as being National Blood Donor Month it’s also National Slow Cooking Month and National Soup Month, as well as: National Sci-Fi Day (2nd), National Bubble Bath Day (8th), Cheese Lover’s/Lovers’ Day (20th), National Compliment Day (24th), and National Puzzle Day (29th)! If none of those suit your tastes, there are many websites like the National Day Calendar which are full of ideas. Most of these celebrations originated in the US, but I find with social media they are getting more and more international. It’s always fun to join in. Here in London there are lots of excitements to look forward to as well. From January 8th – 17th it’s the London Boat Show (which always makes me think of this, in a good way), and the London Short Film Festival runs over the same dates. January 14th – 17th sees Lumiere, which should look amazing, and also for the art crowd there is the London Art Fair (Jan 20th-24th). Lastly, if running is more your style, there are still places available for the London Winter Run (with polar bear hugs! ), which takes place January 31st. 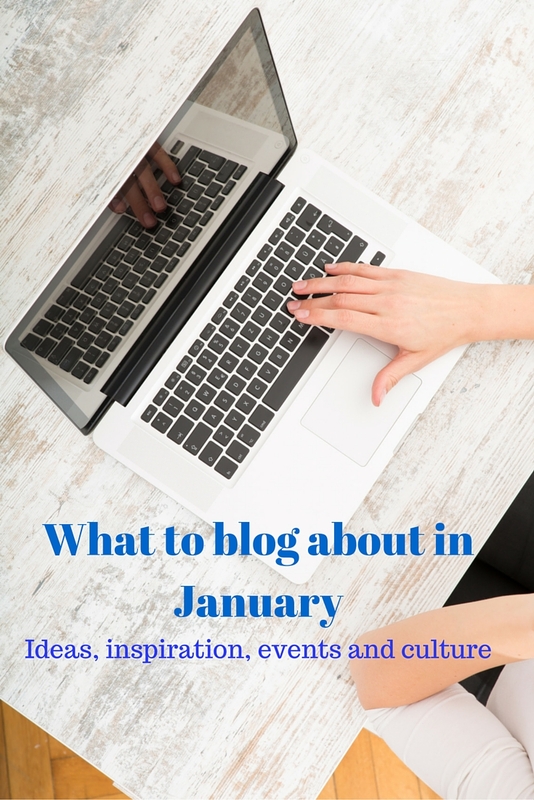 I’ll blog later about some of the cultural elements I’m looking forward to in January (here), but I hope you’ve found some inspiration here for your January blogging. Have fun!